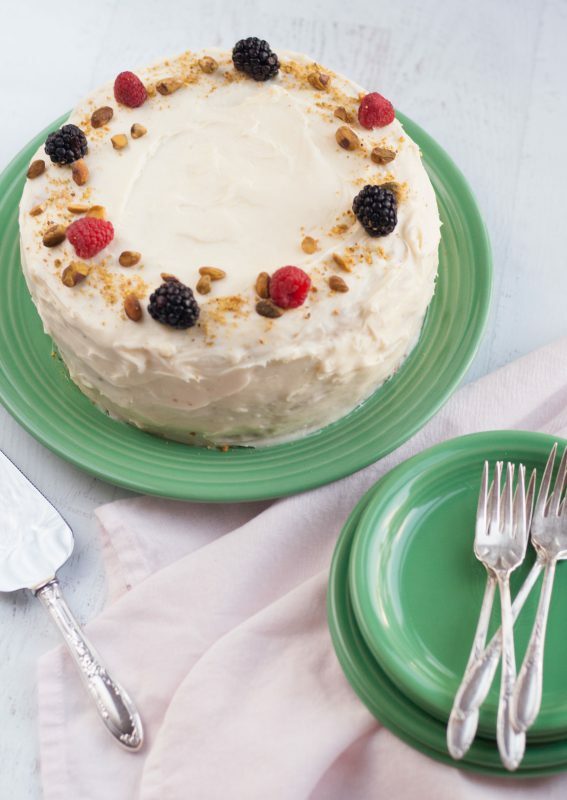 If you like pistachio ice cream, you will love this moist and nutty three layer cake iced with the most delicious cream cheese frosting. This sweet Pistachio Cake was inspired by our newest color introduction, Meadow, a soft, springy green. 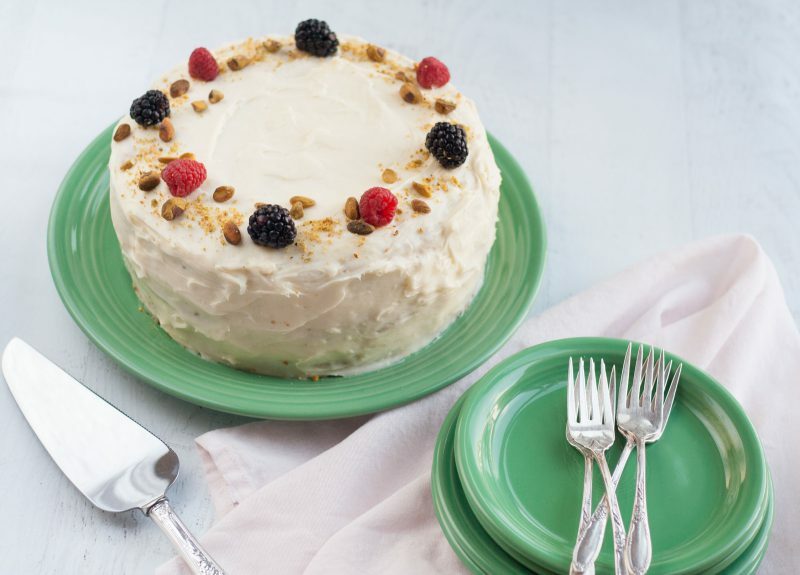 While we let our cake be colored by the pistachio nuts themselves, you could certainly add a few drops of green food coloring to really make a statement. The cake itself tastes remarkably like pistachios, much like a good quality pistachio ice cream. It is light and moist with a slightly nutty texture thanks to those ground pistachios. 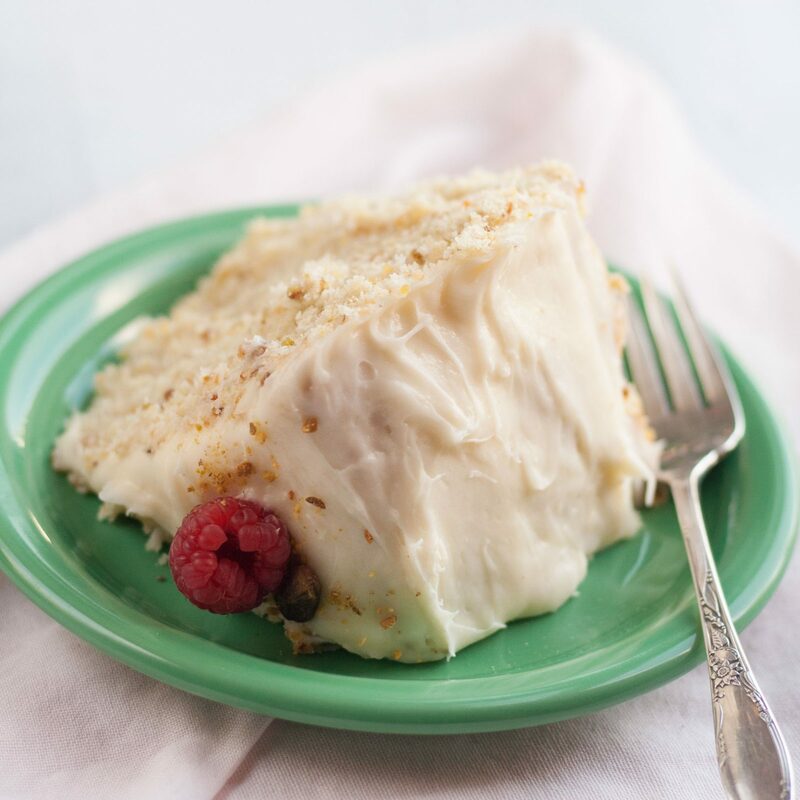 Add to that our perfect cream cheese frosting and it is heaven on a plate! 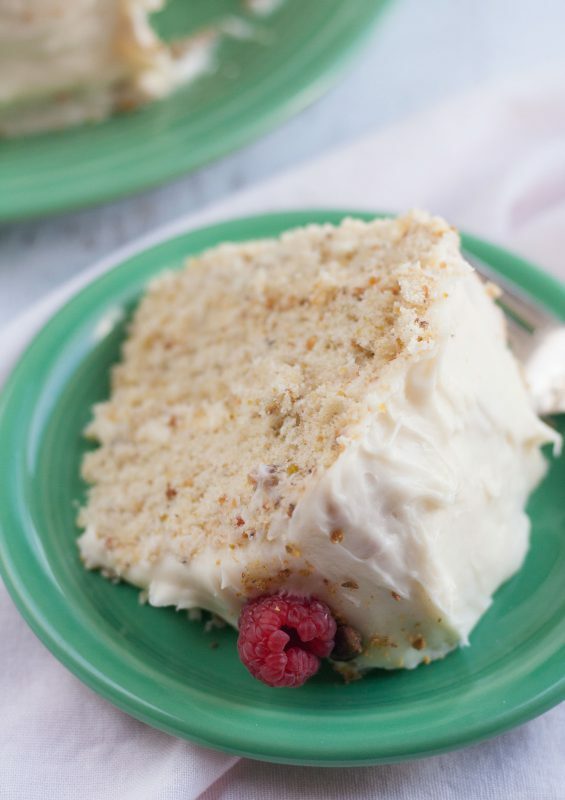 To decorate your cake, save a handful of whole pistachios and grated pistachios. Berries make another charming decoration for your cake, as does edible flowers if you can find them in your area. Light and nutty three layer pistachio cake with cream cheese frosting. Preheat oven to 350°F . Grease and lightly flour three 9-inch cake pans. Pulse the pistachios in a food processor until ground up into very fine crumbs. This will make about 1 and 1/2 cups of crumbs. Save any extra for garnish if desired. Pour 1 and 1/2 cups of pistachio crumbs in a large bowl. Whisk in the cake flour, baking powder, baking soda, and salt. Set aside. Using a handheld or stand mixer fitted with a paddle or whisk attachment, beat the butter and sugar together on high speed until smooth and creamy, about 3 minutes. Scrape down the sides and up the bottom of the bowl with a rubber spatula as needed. Beat in the egg whites on high speed until combined, about 2 minutes. Beat in the sour cream, vanilla extract, and almond extract. Scrape down the sides and up the bottom of the bowl as needed. With the mixer on low speed, add the dry ingredients until just incorporated. With the mixer still running on low, pour in the milk (and the green food coloring, if using) and mix just until combined. Pour batter evenly into cake pans. Bake for around 23-25 minutes or until the cakes are baked through and a toothpick inserted into the center of the cake comes out clean. Allow cakes to cool completely in the pans set on top of a wire rack. Make sure your cakes are completely cool before trying to frost them. In a large bowl using a handheld or stand mixer fitted with a paddle or whisk attachment, beat the cream cheese and butter together on high speed until smooth and creamy. Add 3 cups confectioners sugar, vanilla, and salt. Beat on low speed until the sugar is incorporated, then turn it up to high speed and beat for 2 minutes. If you want the frosting a little thicker, add the extra 1/4 cup or so of confectioners sugar. Using a large serrated knife, slice a thin layer off the tops of the cakes to create a flat surface. Place 1 cake layer on your cake plate. Evenly cover the top with frosting. Top with 2nd layer of cake and evenly cover the top with more frosting. Top with the third layer of cake. Spread the frosting all over the top and sides using a bench scraper or offset spatula. Decorate with garnishes such as whole or ground pistachios, berries, or edible flowers. Refrigerate for at least 30-45 minutes before slicing.